Francestown Town Hall is located at 27 Main Street, Francestown, NH 03403; phone: 603-547-3469. Photo: Levi Woodbury Homestead, ca. 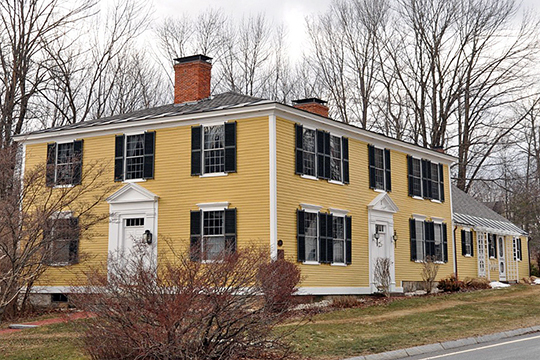 1789, 1 Main Street, Francestown, NH. Listed on the National Register of Historic Places in 2007. Photographed by user:Magicpiano (own work), 2013, [cc-by-3.0 (creativecommons.org/licenses/by/3.0)], via Wikimedia Commons, accessed March, 2014. The area was known to hunters and explorers long before its settlements, on account of its "beautiful meadows." As early as July 18, 1673, a "plat had been accepted" under the government of Massachusetts, purporting to cover most of the town as it now exists. This amounted to nothing, as the location was dangerously remote from any settlements. But it shows the attractiveness of the locality in those early days. The first actual settlement was made by a Scotchman named John Carson, about 1760. It is probable that he was on the ground part of several years before, and that other settlers had made beginnings previous to that year. But the spot on which Carson located, and much of the best part of Francestown, was then a part of New Boston. Granted by Massachusetts in 1736, New Boston had quite a number of settlers and improvements when the claim was purchased by the Masonian proprietors in 1746. From New Boston and some surrounding territory, Francestown was incorporated in 1772. It was named for Frances, wife of Governor Benning Wentworth, and was written as "Frances' Town" in the old records. At the first meeting in June of that year, John Quigley, John Dickey, and William Starret were elected the first Board of Selectmen. The population of the town in 1775 was 200. Reverend W. R. Cochrane, History of Francestown, in History of Hillsborough County, New Hampshire, compiled by D. Hamilton Hurd, J. W. Lewis & Co., Philadelphia, 1885.